A few days later and we are on dirt roads again, this time riding the ‘Top of the World’ Highway from Tok in Alaska to Dawson City in Yukon, Canada. It is dry and the going is fairly easy but there are sections running by a river creek that look like they could be well muddy in the rain. We stopped briefly too at the little mining town of Chicken, Alaska. What a great name! It had originally been called Ptarmigan, from the prolific numbers of these little game birds found in the surrounding area by miners when they first came here prospecting for gold, but no one could spell ‘Ptarmigan’ so they just called it ‘Chicken’ instead! Our bikes started today fairly clean as we took them to a power wash in Fairbanks and it was here that we discovered that all that mud on the Dalton Highway had eaten our rear brake pads. Mine were down to wafer thin but Maggie’s were metal-to-metal. Replacing them was an experience in itself. We had 1 set of spare pads so we needed another and the USA BMW Motorcycle Website listed a ‘dealer’ in Fairbanks – Trail’s End BMW. Think ‘BMW Dealer’ and the normal thing that springs to mind is a chrome and stainless fronted, white tiled, almost sterile showroom with the odd potted-palm and beautiful new bikes on display. We had read stories of people going to Trail’s End and knew that the owner was a little peculiar – a one man band in the middle of nowhere or more accurately up on the edge of the world. We’d heard rumours that he disliked anyone from California to the point of being rude and he hated our bike – the F650. We rang George and he confirmed that he had a set of original BMW pads and was kind enough to offer us some shelter to replace them as it was pouring with rain outside. “Bin up the gravel road – eh? Chews them pads up like nobody’s business. Well that’s disc brakes for ye. In my day we had good old-fashioned drum brakes. None of this nonsense with them. Far more reliable. Well see ya soon” and he hung up. I couldn’t believe that in this day and age anyone would seriously pine for drum brakes. We followed George’s directions into a residential area up the end of a quiet suburban street where we spied a big BMW roundel peering out of some bushes in a wilderness area that seemed totally out of place with its surroundings. A muddy dirt track lead us into the bush and we were soon surrounded by a collection of old automobiles all in various states of returning to nature. By this I mean they were rusting and overgrowing with mosses and foliage. An old 1950’s era BMW car sat with its rear window wound half way down. The back seat and floor contained a little mini version of the outside forest. There were bikes everywhere, from the latest 1200GS model to older bikes, all under blue tarpaulin wraps and in various stages of disassembly and repair. George came out from his house and directed us to an old wooden shed where he had cleared a bit of floor space and laid out all the tools we’d need to change the pads. He was an old guy, with a crooked posture (probably from crawling around working on bikes) with an untidy bushy grey beard. But he had a keen brightness in his eyes, a light there suggesting sharpness and intelligence and that he obviously knew a thing or two about bikes. We felt we were being scrutinised as he looked us up and down. We were directed to ride the bikes up one at a time squeezing through between various decrepit cars. I tried to engage George in some conversation asking him how long he’d been in Alaska. “Came up in the 1960’s, but here I’m not here to socialize and chat. You got a job to do” and he turned and walked off back to the house. We changed the pads, grateful to be doing it in the draughty but dry shed. It was an easy job and in a half hour we were back at the house to pay for the pads. We were invited in while he prepared our invoice and asked us to sign his guest register. The place was an Aladdin’s cave of BMW – there wasn’t a clear square inch of space that wasn’t piled high with bike parts and paraphernalia – even the sofa and the refrigerator. He didn’t like the 650 – wasn’t a proper BMW – not like a boxer. But he liked what we’d done with ours. Fork gaiters – “good idea keep the mud and crap off your sliders”. Metal boxes – “Don’t need ‘em. Never had ‘em in my day. No need.” Maggie pointed out that we needed them for all our camping gear and for all the kit necessary for a big trip – “Well never camped myself, so maybe they’re OK for that”. We also pointed out to him that other off-road bikes were all too high for us and the 650 was better suited to our short legs. “Well they seem to fit ya well. No denying that”. It was probably the closest anyone ever had gotten George to admitting the F650 was a fair bike. “Well gotta go to the Post Office. Can’t stand round here chatting all day” and with that we were dismissed and we left. 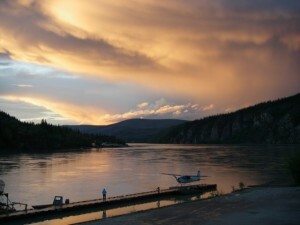 The end of the ‘Top of the World’ deposited us at a river crossing – a ferry taking us across the mighty Yukon River once again. On the other side lay Dawson City. It was Saturday evening and the Alcan 5000 rally was in town. The streets were full of KTMs, BMW 1200GS Adventures and lesser bikes like the KLR650 all sporting rally plates. Surprisingly there was even an F650GS like ours – we’ve never thought of our bike as a possible rally vehicle. The downside to all these bikes in town was that there wasn’t a scrap of accommodation to be had anywhere. Even the campsite was full although the owner told us we could put our tent up anywhere we could find a convenient space. We wandered back to the bikes where we met a big guy from Argentina – Guido, riding a 1200GS Adventure. He invited us to camp right beside him so we ended up with our tent squished on the edge of his site and partly sticking out on the road. We parked the bikes alongside the tent to protect us from passing traffic. We haven’t been anywhere on this entire trip that has felt so much like a frontier town as Dawson City. The streets are all unpaved and most of the buildings are in various states of collapse as their wooden structures sag and relax. Dawson has been flooded when the Yukon River broke its bank and buried the place under several feet of mud. It has been destroyed by fire on several occasions, the flames consuming the all-wooden buildings. But it was a place we really wanted to see as it was the Mecca for the Klondike Gold Rush. In its day, back in 1897-1898, Dawson City was the Paris of the North. Here the prospectors came in from the mines with their pockets full of gold and looking for a good time after months of digging in the dirt and living under the most Spartan conditions. It was a wild party town and a place to let off steam. People bathed in champagne simply because they could or dined on the finest fare and decked out their ladies in the latest fashions from Paris. Establishments like the Monte Carlo sprang up where fortunes were won and lost on the turn of a card or the roll of a dice. All tastes were catered for. Girls sat on window display in the red-light district and a man only had to pick his fancy and for a poke of gold dust she was his for the night. Dawson City was an American town (that’s where most of the stampeders came from) but it was most definitely in Canada so thankfully there were no guns, as strictly enforced by the Mounties who kept a firm control of law and order. Everything closed for the Sabbath and a man could be run out of town for the least infringement of this statute. It all lasted for around 2 – 3 years until all the claims had been staked and fresh gold strikes were reported further on into Alaska. Then the whole travelling circus broke up and moved on. After this Dawson became a ghost town. But there’s gold aplenty in them thar hills and today the Klondike still churns out millions of dollars of yellow metal every year. By day Dawson City has the feel of a ghost town about it. We wandered its dusty boardwalks up and down lazy dirt streets, sauntering along Front Street and up on to the huge dyke, built to keep the river out. We mooched the shops and savoured the attempts to preserve Dawson’s past. The Museum had an excellent movie on the Gold Rush narrated by Pierre Berton and walking back out into the streets afterwards made us feel that the movie was running on, only it had changed from black & white to colour. We had an excellent dinner at ‘Klondike Kate’s’ where we met one of the Alcan guys, who’d just blown his KTM 950 Adventure. After several beers it emerged he’d been sat at 100mph for over an hour trying to make up time when he blew the big end – the whole thing just exploded and that was the end of the bike! We left Dawson riding past lines of spoil heaps that marked the entrance to the Klondike gold fields. In chapter 28 I described how people spent months travelling to the Klondike from Skagway, over the Chilkoot or White Passes and up the Yukon River enduring unbelievable hardships along the Klondike Trail to get to Dawson. We rode it (in reverse) in a single day from Dawson City down to Whitehorse and then down over the White Pass and into Skagway. It was a tedious ride to begin – big straight roads lined by Spruce trees demanding ever constant vigilance for wildlife lest a bear or a moose runs out on you. Beyond Whitehorse we travelled more winding roads that took us on into mountainous regions towards Carcross, stopping to look at the odd mouthwash blue pool or lake by the side of the road. Then suddenly all the Spruce and granite rock gave way to sweeping golden sand dunes and we were in a desert! It was mind-boggling. Desert is not a word you would normally associate with Canada. It wasn’t a very big desert mind you – in fact the Carcross Desert is the smallest desert in the world – but there it was nonetheless. The sandy area was once covered by a glacial lake, long since exposed by the retreating glacier. Wind from nearby Lake Bennett constantly stirs the sand making it difficult for vegetation to take root although the odd lodgepole pine has sprouted through here and there making for a weird vista. We climbed on and over the spectacular White Pass, re-entering Alaska at the border post there with a very hospitable welcome from the border guard on duty. The White Pass was a scary road. It just about clung to the side of the mountain and dropped off into a river that we could hear rather than see at the bottom of an improbable gorge. We were blasted all the way with a chill rain blown along by the freezing gale force wind that welcomed us from the mouth of the pass at Skagway. The mountains themselves were covered in tendrils of wispy low cloud that turned to fog in several places giving the pass an even greater air of menace. Once again we marvelled at the tenacity of the Gold-Rush Stampeders. We were on our bikes, layered with hi-tech thermal and heated clothing, secure in the knowledge that a warm bed lay a few miles on and we could easily get there at the twist of a throttle. To begin with the Stampeders tried to force the pass on horseback and using pack mules to ferry supplies. Thousands of horses were killed and for a while the pass became known as the Dead-Horse trail. Horse carcasses lined and indeed paved the trail. It was difficult terrain, the animals were in poor condition to begin with – bought cheap and then shipped thousands of miles to Skagway. There was little fodder along the way and as we discovered the climate could be horrific. Once they reached Lake Bennett those horses that survived were simply abandoned and the journey on up the Yukon continued by boat. Conditions became so bad that for a while the pass was closed and eventually a mountain road and then a rail route were built linking Skagway with Lake Bennett. In Skagway we found a delightful Bordello that now days functions as the ‘Historic Skagway Inn’. The town has a beautiful location set deep in a fjord surrounded with stark snow and ice patterned mountain walls. 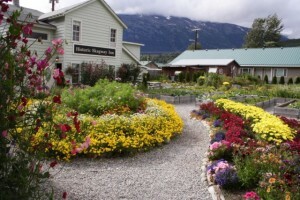 Skagway – jump off point for the whole Klondike Gold Rush. You can wander the streets on a quiet evening and still imagine the fjord forested with ship masts as cargoes were unloaded and Stampeders organised their gear for the strenuous journey ahead. But where Dawson City was Canadian and policed by the Mounties maintaining some law and order, Skagway was technically in the USA but so remote as to be beyond the power of any law. It’s a fact that more people got rich during the gold rush making money off the Stampeders than by actually travelling to the Klondike and digging for gold. Some did it legally by selling supplies necessary for the journey, in fact whole cities such as San Francisco, Seattle and Vancouver made their fortunes as outfitters for the Goldrush. Stampeders came to Skagway all loaded and ready to go, fully provisioned with materiel and a bit of money – their grubstake – necessary for the road ahead. But Skagway was full of opportunists eager to get rich by easier means and ready to thieve, steal and cheat their fortunes. Most famous of all was Jefferson Randall ‘Soapy’ Smith who for a while became known as the King of Skagway. Soapy Smith was a smooth-talking con-man and he headed for Skagway at the onset of the Gold Rush realising there were easy pickings from the legions of prospectors whose heads were full of the lust for gold. He earned his nickname from a scam whereby he’d gather a crowd round to hear him orate the virtues of a miraculous soap he was selling. It was a cure for baldness, made wrinkles disappear, restored youth and vitality etc, etc. But best of all in the tray of soap for sale, some of the bars had $20 bills inside – so step right up and chance your luck! Only $1 a bar! Some guy would rush forward with his dollar, open the soap and sure enough there was a new $20 bill inside. Same thing happened to the next guy. Soon there was a rush on but of course nobody else won any money – they just paid $1 for a nickel bar of soap! The ‘winners’ were merely Soapy’s placed men, in on the scam to get the crowd going. In Skagway, Soapy ran a bar – Soapy’s Parlor (it’s still there today) where hapless Stampeders were cheated out of their grubstakes by various scams. His men worked by looking for newcomers, just off the ship and they would befriend and ingratiate themselves offering to help the new guy get set up and started. All the while they were assessing their target and when the time was ripe they’d set the guy up to lose the lot. Soapy honestly believed he was doing these people a favour as he was saving them from a worse fate on the trail ahead. Indeed Soapy’s Parlor had the Latin inscription ‘Caveat Emptor’ over the bar – buyer beware! He reckoned that anyone foolish enough to gamble deserved to lose. Over the months in Skagway his gang grew bigger and bolder resorting to daylight robbery and even murder on occasion when more subtle methods had failed. Soapy was being called ‘The King of Skagway’ as he seemed to run the whole crazy town with over 70 bars and saloons, all patrolled by Soapy’s gang looking for gullible targets. Eventually the more respectable citizenry of Skagway formed a vigilante group to protect the town’s best interests. They were headed by a guy called Frank Reid, a civil engineer and town surveyor, who was appalled by the excesses of the Smith gang. Soapy reacted by forming his own vigilante committee to safeguard ‘business interests’ (i.e. the bars and saloons) of the town against interfering ‘newcomers’. Things came to a head when a returning prospector, a man called Stewart, was brazenly cheated out of $2800 of gold dust at Soapy’s Parlor. He went to the local US Marshal who was in Smith’s pay, who dismissed the prospector and told him if he wanted gold to go away and dig some more. Stewart then went on round the town crying to all and any about what had befallen him. It roused the more upstanding citizens who gathered by the docks. Soapy was by now too big for his boots. He believed he could do anything he wanted in his town. He owned Skagway so he strapped on a gun and set off to sort this out. He found Frank Reid waiting at the docks and demanded he get out of the way. Reid refused and both men opened fire. Smith was killed instantly but Reid suffered a groin wound and he died a slow lingering death 3 weeks later. It was the end of the Smith gang – the rest of his cronies were rounded up or run out of town by the enraged townsfolk. In the morning following our dramatic ride over the White Pass, we emerged from the bordello onto the busy streets of Skagway. They were jam packed with tourists off 4 enormous cruise liners down in the harbour, their upper works and funnels floating over the whole town like some sci-fi alien spaceship invasion fleet. The tourists were on a mission – shop-till-you-drop, gottagettanutheralaskasweatshirt, Heylook!thisshopsgotkeyrings, Oh!theresthechristmasshop overtherequickletsgo. The crowd was inflated too, ballooned with shopping bags and the main street was bedlam to walk from one end to the other. We chatted to a cop later on who told us they’d had 9,500 people in town that day – all compacted into an area roughly 7 blocks by 3. The whole thing was bewildering. Skagway has been ruined by commerce. Christmas shops? Swiss jewellery? The main historical section is owned by the National Park service and we took a short ranger lead walk, identifying some of the important buildings and historical aspects of the town. The Ranger told us they had 950,000 tourists last year, mostly off the cruise ships. The Park Service makes money leasing the old buildings to shops who do a roaring trade in the short summer tourist season – the 2nd Gold Rush the shopkeepers are calling it. As if that’s not bad enough the State of Alaska had just passed legislation authorising the collection of a new $50 per passenger cruise ship tax, which struck us as incredibly greedy, given that they are coining it in already. We did manage to escape from the crowds. We wandered back out of town and found the old cemetery where Frank Reid and Soapy Smith are buried. Their graves lie in amongst a pine thicket with others from that era where tree roots and ground subsidence have disturbed the little white headstones so they look like they are lying in a pine needle clad storm tossed sea. One of the headstones marks the last resting place of an unknown man. He tried unsuccessfully to rob the local bank with a pistol and a stick of dynamite. The dynamite went off and they buried his head & some yukky bits but they never found out who he was. The old Skagway was really brought to life for us by the “Show of ’98” an old Music Hall stage show that claims to have been running for 84 years telling the story of Soapy Smith. Pre-show entertainment and warm up was provided in the gaming hall where you can gamble away fake money on roulette wheels and card tables. Then, ladies and gentlemen please take your seats, as the lights dim and the show goes on… This was small town theatre at its best as a tall handsome actor centred stage inviting members of the audience up to participate in some of Soapy’s best known scams. There were ‘dancing girls’ and monologues from the Smith actor portraying the rise & fall of the conman. We loved it! The next evening we rode down to the docks, near the spot where Smith & Reid killed each other, to catch the ferry on the Alaskan Marine Highway taking us on the next stage of our journey down the Inside Passage to Sitka and the end of our trip.